THE JOURNEY: A NEW GENERATION CHURCH OF CHRIST has strong biblical beliefs, and recently we have published what we believe, value, and practice online for people locally and globally to access. 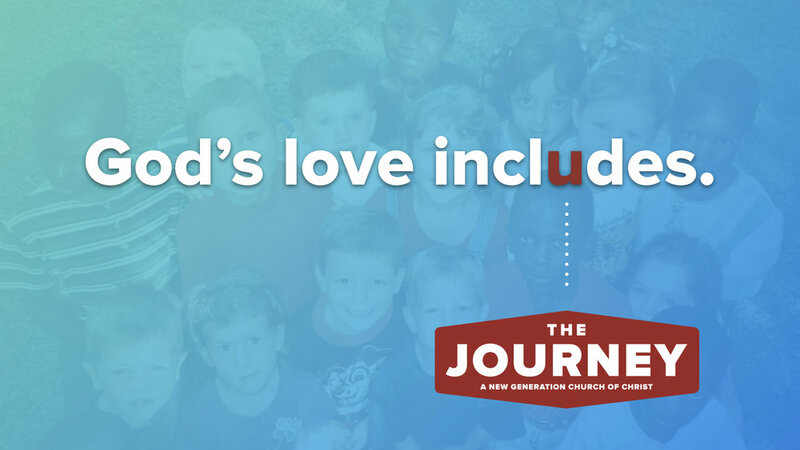 THE JOURNEY leadership believes that God’s Love Includes. Leadership is calling the church to pray for six weeks, until August 1, 2018, about how our church lives out this focus, God’s love includes. Leaders ask you to pray about how we may grow spiritually, and make improvements in how more of our congregation and new people to our church take next steps in discipleship. Finally, leaders are calling for the congregation to engage in commenting on this blog that describes our focus, beliefs, values, and practices. We see this as a living document that is open to revising for how best to biblically and theologically express our beliefs and practices. We have done something unique in how the beliefs are written. For years our vision, mission, beliefs, values, heritage have been divided into different sections. Now, we have combined all these elements into a set of statements about what we believe and practice. We believe this leads to more engagement in how our beliefs really work in our congregation and our life in the world. Recently our church shepherds and staff have improved the way we make decisions, and that improvement is to take our church's pain, feelings of desperation, grief, joy, heartache, frustrations and take 30 days to pray about major decisions. When we tried this last fall, praying for the Holy Spirit's direction about more intergenerational friendships, we believe the Spirit worked in Karissa Kostelnick and Ashley Taylor to start two new events or environments where these friendships can grow: Student Led Extreme Worship and Journey Cafe. Now, we are again asking the church to pray with us about how our church can grow spiritually, live out these beliefs in practice, grow in numbers, grow in discipleship and in how we equip and send people on mission. We are re-producing our beliefs below in this blog post and below that giving you opportunity in the next six weeks, until August 1, 2018, to respond on the comments with your reflections on these beliefs. How do these beliefs move and inspire you? How do you see the focus of these beliefs in contrast with your previous experiences? What are some scriptures that these statements bring to mind, because we have developed them out of long years of reading scripture and growing in the long history of Israel and the church and how we believe and act on our beliefs in God. WHAT DOES THE JOURNEY BELIEVE AND PRACTICE? The love of God expressed in the community of Creator, Jesus Christ, and the Holy Spirit is what matters most on The Journey. This love in the community of God overflows to include relationship with humanity. God loves all people. God's love includes you and us, of all people. Humans like us have a historic and deep problem with rejecting relationship with God, but God relentlessly persists in what is called a covenant to keep the promise made to ancestors of our faith including Abraham and Sarah, that God would bless all nations. Jesus fulfills the hopes of Israel to have a Messiah who would start putting the world back together by peace, mercy, and justice of God. Jesus is the Son of God who died for all people, but God raised Jesus from the dead to reign as Lord of heaven and earth. We focus on the teachings of Jesus and how our Lord and the apostles interpreted and lived out the law, prophets, and writings. Our mission is to invite all people into Christ centered life. In preparation for the return of our Lord, we all have next steps to take daily with this One we follow and claim as the center of our lives and the cosmos. God breathes life into those who want to be God's children and ask for the Holy Spirit. God's Spirit is described as wind, fire, and is poured out on the church to empower us to live in step with the mission of God to redeem all nations on earth. The love of God calls for a response of thanksgiving and praise, and worship reminds us that God is great and we are not. In worship gatherings we welcome and invite all people to take next steps with Jesus. Each Sunday we share bread and a cup of juice that reminds us there is no greater love than one who gave his life for us. We practice open communion based on the example of the inclusive table fellowship of Jesus, who ate with sinners, like us. We invite those of any lifestyle, religion, or ethnicity who believe or want to believe in Jesus to eat bread and drink in fellowship with us. Sin is anything humans do to destroy the love of God or the image of God in ourselves or others. We reject the condemnation racket of selecting particular sins to be worse than others that leads to treating people as less than, unworthy of God's love and human affection. We are all sinners in need of God's redemption. We believe God saves all sinners by grace through our faith in the crucified, risen, reigning, and coming Messiah Jesus. Baptism is the countercultural way followers of Jesus receive God's grace as an effective sign of salvation and pledge of allegiance to the Kingdom of God and not the kingdoms of this world. With witnesses to our baptism, we join the worldwide body of believers who follow Jesus into immersion as a public sign of receiving God's deep love, washing forgiveness, and saturation of the Holy Spirit. People loved by God and inspired by the Holy Spirit have written the Bible to tell the story of God's mission to redeem the world. When we read the Bible, our lives are changed and we are confronted with a choice to hear the voice of God and respond in keeping the covenant of love or close our ears to serve ourselves and our idols. Being a member of The Journey means you have made it known that you are following Jesus and want to "Join The Journey" and are taking next steps with Jesus. We are a community that asks one another, "What's your next step?" because we believe young and mature followers have next steps to take with Jesus. When we cease taking steps with Jesus, we cease following Jesus. Prayer is humanity's lifeline to God and each Sunday we pray, "Our Father in heaven, hallowed be your name. Your kingdom come, Your will be done, on earth as it is in heaven. Give us this day our daily bread, and forgive us our debts, as we forgive our debtors. And lead us not into temptation but deliver us from the evil one. For yours is the kingdom and the power and the glory forever, Amen." We regularly discern next steps for our church only after periods of prayer and listening for what the Holy Spirit may be saying to us. We help one another transform from serving ourselves to serving others like Jesus. Leaders will not lord over people but put power under people. The Journey expects all people to use their gifts and talents to glorify God and to build up the body. The Journey is overseen by leaders called Shepherds and the daily operations are led by ministry staff. We are committed not to be a celebrity driven church, so we try to de-emphasize one person's role and spread leadership and service to many. As we serve and lead, we have fun together in gatherings, cracking jokes with a lightness of spirit that doesn't diminish the humanity of any person or group, nor does it gloss over heartaches and grief, but remembers God will make all things new. We believe just as surely as God has loved and called all nations to worship and love God and one another, so also God will judge all nations in wisdom, righteous justice, and mercy. God will bring an end to evil, earth will be renewed, and all things will be restored in what is called the New Heaven and New Earth. Until that day, we will channel God’s overflowing love through missions to share the hope and love we have found in God. Since God is the original missionary, we will imitate God by learning to be missionaries wherever we are but also send long-term missionaries locally and globally to share good news of Jesus Christ.